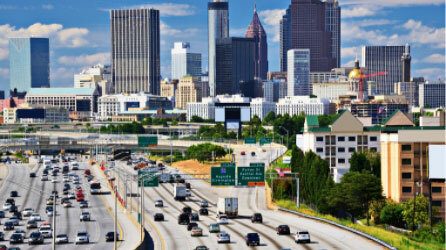 Downtown Atlanta encompasses a wide variety of attractions to suit any traveler’s preferences. Home to Georgia State University, Centennial Olympic Park, and the Georgia Aquarium, it’s worth a visit! While you’re here, you can also enjoy several hotspots for Atlanta downtown shopping! Tons of great boutique shops and malls surround this lively commercial district. Read on to discover seven places we recommend for the best shopping near Downtown Atlanta! Don’t forget that you can also request a free Travel Guide to learn more about shopping, dining, and entertainment nearby! If you’re looking for a convenient shopping area directly in Downtown Atlanta, feel free to check out Peachtree Center. This large business neighborhood includes dozens of shops and restaurants worth exploring, all connected via expertly designed skywalks. Where Peachtree Center shines is in the sheer number of cuisines available. No matter what food you’re in the mood for, you can find a restaurant to satisfy that craving! Keep in mind that some improvements are currently underway and may cause minor inconveniences or temporary closures. Check out their renovations page for more information. While Peachtree Center is undergoing partial renovations, Underground Atlanta is in the midst of a major revitalization. This historic area of Downtown Atlanta was once a thriving shopping and entertainment district, but it’s now in need of a facelift to get it where it needs to be. It is currently closed, but be sure to keep an eye out on their website for construction progress! The plans for renovations look promising, and we’re excited to see Underground Atlanta’s new look! Take a ten-minute drive from Downtown to find Ponce City Market. Located in a revitalized landmark building, Ponce City is not your average shopping mall. Inside, peruse the Central Food Hall to indulge in tasty foods crafted by James Beard Award-winning chefs. There are top-notch restaurants, bakeries and candy shops. If you’re looking for clothing and fashion shops, there are plenty of great options here. You can even take an elevator ride to The Roof and enjoy miniature golf, drinks, carnival games, and stunning panoramic views of Atlanta. For high-end shops and boutiques, we recommend heading over to the Westside Provisions District. Just 15 minutes from Downtown, it’s an entire district dedicated to fine dining and unique shopping. Here, you can find the highest quality and highly-sought after products from clothing to jewelry and furniture. Their shops include Ann Mashburn, Sid Mashburn, Hudson Grace, and Peridot West. After browsing for the perfect items, take home a bottle of fine wine from Perrine’s Wine Shop or sit down for a delicious, sizzling steak at Marcel. Local tip: If you struggle to find parking at peak times, there’s valet service available. Just a little further north, you can check out Phipps Plaza in the heart of Buckhead. This indoor mall is another fantastic option for high-end shopping. Explore over 100 stores, including Gucci, Saks Fifth Avenue, Nordstrom, Versace, and more. If you want to catch a showing of the latest blockbuster, you can pause your shopping and head over to the 14-screen movie theater! For a post-movie meal, we suggest the tasty options at The Tavern at Phipps or Davio’s. If you’re in the mood to shop-till-you-drop, you can check out Lenox Square across the street from Phipps Plaza. Here, you’ll find an abundance of additional destinations for shopping and dining. The facade of the mall, with a two-story glass entrance, is spectacular. Step through the porte-cochere and explore Cartier, Macy’s, Vineyard Vines, and many more. For dinner, grab a slice from California Pizza Kitchen or sit down for a quiet meal at Zinburger Wine & Burger Bar. Another excellent option in Buckhead is Shops Around Lenox. This outdoor mall features street artwork and murals from local artists, adding a little beauty and culture to your time there. Shops Around Lenox even organized itineraries for customized experiences at the mall. Depending on your preferences, they tell you the best shops and eateries to check out! The only way to make your shopping adventure in Atlanta even better is by having an elegant place to relax afterward. Once you’ve explored the malls, perused the boutiques, and filled up on gourmet food, top it all off by returning to a luxurious room at Stonehurst Place. Our bed and breakfast in Midtown Atlanta is the best place to stay if you’re looking for unmatched accommodations in a convenient location. We’re just a short walk or drive from all the hotspots for shopping, entertainment, and dining, and offer amenities you can’t find anywhere else! When you step inside The Eaves, you’ll immediately fall in love with its decor and high-end furnishings. 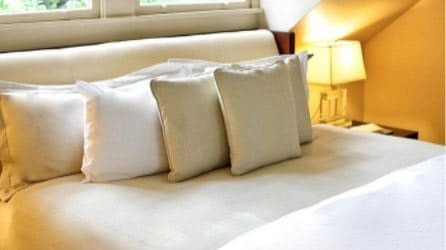 It’s the best place to relax and enjoy Atlanta in style with its queen-size daybed dressed in luxury linens, picturesque windows, and museum-quality artwork. In the contemporary bathroom, enjoy custom marble flooring, a towel warmer, and plush bathrobes. Once you stay one night here, you’ll want to come back again and again! Check the availability of our rooms and start your one-of-a-kind experience in Midtown Atlanta! Remember to get your free Travel Guide and explore all of the possibilities in our area!